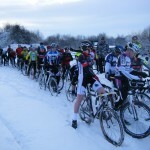 Welcome to North East CycloCross League home of friendly grassroots cx racing for all abilities in the North East. If you are thinking about going to your first race read the brief getting started guide. 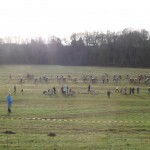 Well what a cracking Grand Final was had by all, with nearly 90 riders on the day competing for there last few points to sort out their Final League positions. It was a Grand day with a fantastic course with mixed terrain of climbs, downhills, fast tarmac sections and some singletrack through the woods. 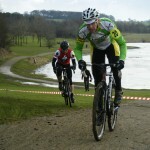 Riders and bikes were clean considering the recent thaw but the Lake was still frozen. The weather remained dry for all three races and even the sun popped out during the main race. As for the Results well there was a great battle between Adam Martin & Steven Ward for 1st & 2nd place but on the last lap Stevens race skills came into there own and beat Adam by just under a minute. Malcolm Lewis held 3 rd for the whole race. First Vet was visitor Pete Wilkin and 1st Lady was Pam Glover who had a great final ride to the season. In the U16/14 race William Brown again took the title and there was some great battles for 4th & 5th place between James Edmond & Alex Harris. In the U12 Thomas was again battling with Matthew Worton who has had a great end to the season and went down to sprint finish with Thomas beating him on the line. Again there was many battles for position during the race with another Sprint finish involving Angus Brown & Fin Robertson. Many thanks must go to Dave McLean and all the many helpers on the day inc the Hetton Hawks Ladies for the refreshments. Also a thank you to Sunderland Council / Springboard for use of the venue. Well words or photos just dont do the setting at Hetton Lyons today justice. What a winter wonderland setting for the Christams Round. Nearly 55 riders turned out on the day to test their snow riding skills to the max. 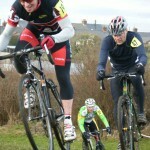 The U12’s raced on a new circuit set out by Jamie Brady & Dave McLean. The U16/14’s raced on the full sen circuit which was an altered version of Rd 1 planned by Tony Glover. The kids had the most fun on the day but not on their bikes but making snowmen, sledging on the bmx track and of course snaowballing the adults ! The only thing missing was some Swiss Cowbells at the finishline. Many thanks must got to Tony Glover, Dave McLean, Jamie Brady, Rob (from Trihard) and the Hetton Hawks ladies for the Festive Refreshments. There was 12no cash prizes on the day and goodies for all the U16/14/12’s as well. 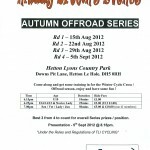 3no Free Race Entry Vouchers were also awarded for Rd 8 at Whickham Thorns on Sun 20th Jan 2010.